With a launch party on Jan. 31 and a coming Super Bowl commercial, Colgate-Palmolive Co. is making a big splash for its new version of Colgate Total toothpaste. As part of the reformulation, the company is cutting a controversial ingredient that it’s stood by for years. Colgate-Palmolive has already removed the substance — triclosan — from its soaps while keeping it in toothpaste, saying its use there is approved by the U.S. Food and Drug Administration and that it helps prevent gingivitis. Health advocates have cautioned against the chemical, and the FDA has itself said studies raise questions about triclosan’s potential links to cancer, effects on the thyroid, and role in making bacteria resistant to antibiotics. Colgate-Palmolive, which has been developing the new version for 10 years, hasn’t widely announced the substance’s removal yet. Spokesman Thomas DiPiazza didn’t respond to questions about whether it was removing triclosan because of regulatory scrutiny or health concerns. Colgate-Palmolive previewed the coming reformulation at a conference in September. “We are bringing to the marketplace a completely new Colgate Total,” Chief Executive Officer Ian M. Cook said, according to a transcript of Barclays Global Consumer Staples Conference. He said it will treat the same things it did before, including plaque, enamel protection and cavities, but adds benefits, like “instant neutralization of odors to improve breath health.” He added the product had 60 patents behind it. It wasn’t until a direct question during a Q&A that he confirmed the change in the toothpaste’s active ingredient. “The technologies in that product will see us replacing the ingredient we have in Total, today the triclosan,” Cook responded, according to the transcript. He said the product would hit shelves early this year. “This product was the most concerning one with triclosan after soaps, because it was putting it right in your mouth,” NRDC senior attorney Mae Wu said of Colgate Total, citing concerns they’re easily absorbed there, and have been shown to affect muscle functions. Concerns about antibacterial resistance, meanwhile, have circulated since at least 2000 — just three years after Colgate Total with triclosan won FDA approval. In 2010, the NRDC sued the FDA over the chemical, saying the agency had proposed to regulate triclosan since 1978 but never done so. In 2011, Colgate removed triclosan from soaps, citing changing consumer preferences and superior formulations. 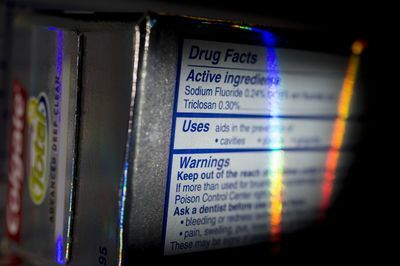 But when it came to the toothpaste, the company said, a rigorous FDA process had approved it. A closer look at that review in 2014, however, raised questions in light of recent science around hormone disruption. At the same time, millions of Americans are putting it in their mouths every day, by way of a top-selling toothpaste that uses the antibacterial chemical to head off gum disease – ColgatePalmolive Co.’s Total…. By Tiffany Kary, Cancer-Linked Colgate Total Ingredient Suggests FDA Flaws, August 11, 2014, Boomberg News. By 2016 the FDA said it would restrict triclosan in antibacterial consumer soaps, and the next year it also restricted it in health-care settings. It urged people to use plain soap and water, saying antibacterial soaps weren’t shown to be better at preventing illness, and their use “raised the question about negative effects” on health. Note: Total U.S. retail sales of oral health products at current prices. 2018 data is an estimate and 2019-2023 data is a forecast. Colgate’s toothpastes, including Total, have continued to be among the top-selling brands in a market worth about $3 billion in sales 2017, according to Mintel Group. That may be changing, though; while sales have been flat for Colgate and Crest brands, Mintel says, there’s been growth for niche brands, like Tom’s of Maine, also owned by Colgate-Palmolive. “As natural brands continue to push the envelope for higher standards, they will be looking to appeal the expanding base of consumers that are concerned with clean labels,” Mintel analyst Karen Formanski said.